WELLINGTON (Reuters) - Britain's Prince Harry and his wife Meghan bestowed names on Wednesday to two newly-hatched young of New Zealand's national bird, the kiwi, in the northeastern town of Rotorua, on the final day of their two-week tour of the Pacific. 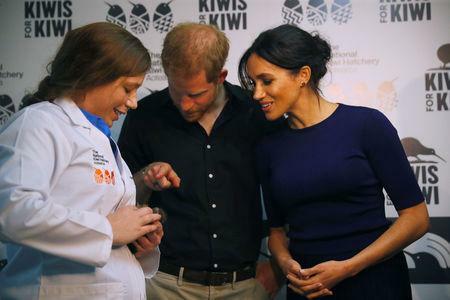 The couple visited a breeding program for the endangered species and admired two three-day old chicks, whom they named Koha, meaning "gift", and Tihei, derived from a phrase that means "sneeze of life" in the indigenous Te Reo Maori language. Earlier, Harry led a group at a Maori meeting ground in singing "Te Aroha", a traditional song, whose name means "Love" in Te Reo. The couple were welcomed at Te Papaiouru Marae, visited by Harry's grandmother Queen Elizabeth in her coronation year of 1953, in Rotorua, a town famed for its geothermal activity and described by its mayor as the 'heartland of Maori culture'. Meghan, who wore a navy Stella McCartney dress and a carved greenstone necklace gifted by the country's governor general and Harry, in a grey suit, were both adorned with feathered cloaks gifted by local Maori. His enthusiasm for the Maori language was welcomed by Rotorua Mayor Steve Chadwick, who said, "As our confidence as a bilingual district grows, so does our confidence in our people and our future." A group of children gave an impromptu haka, a traditional war dance made famous by New Zealand's All Blacks rugby team. A toddler wandered toward Harry through the metal barricades holding back the crowds, but the prince quickly sought out his family and directed him back.